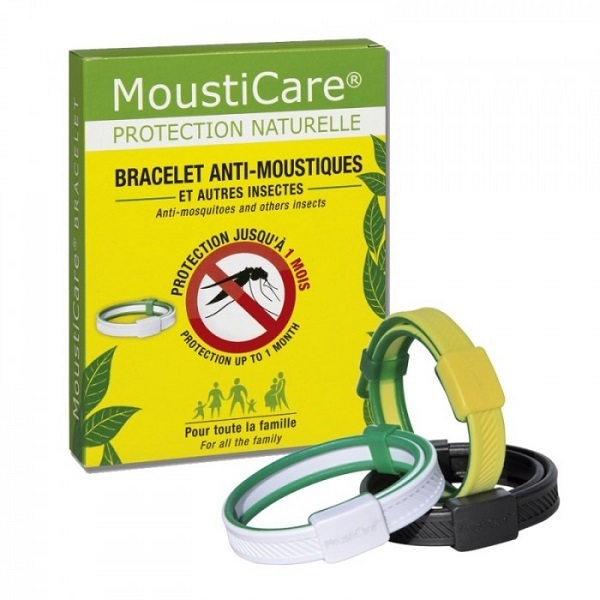 The Mousticare Adjustable anti-mosquito bracelet, is practical, just put it on and it provides you with excellent protection. Contains no harmful substances, ideal for the whole family! - Anti-mosquito bracelet: Ideal during your outdoor activities, while traveling in the tropics, or every day to protect yourself at home as in travail. - The Mousticare strap contains a natural repellent: purified geraniol, from the Cympobogon plant. - It effectively repels mosquitoes, protection for 1 to 2 months. Mousticare suitable for adults, children over 3 years old and pregnant women. - Active after 1 hour of wearing the product (after a month of use, active after 2 hours of waiting). - After a bath / shower, after two hours of waiting. - Change bracelet when coverage decreases, remove if prolonged swimming. - For immediate protection, complete with Mousticare Spray Skin. - May possibly cause mild reactions warm or tingling. These are temporary and related to the activity of the product. In case of strong reaction, remove the bracelet. - Do not use if you have an unusual reactions incase of an unknown allergy! Do not use if you have any allergies to any of the ingredients. Mousticare The brand offers a range of natural repellents with proven efficacy. Mousticare offers an alternative to chemical repellents. Its natural components (free of toxins and alcohol), are effective against the European and tropical mosquitoes & bugs. The Mousticare range is designed for the whole family, ideal for travel and protection at home.